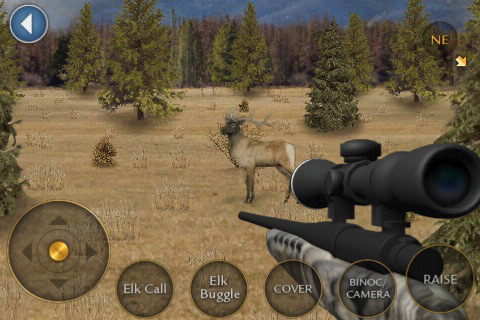 Home Games Real Trophy Hunting App Game for Real Hunters! Real Trophy Hunting App Game for Real Hunters! If you are an addictive hunter or just an amateur of hunting activities, you might be pleasantly surprised by a new game for your iPhone and iPod touch. The app game is called Real Trophy Hunting. This hit hunting app game was developed by the founders of another hunting game genre & App store hit, Real Deer Hunting. The game-play will make you feel yourself a real hunter in the real Rocky Mountains. Wonderful graphics and sounds as well as different weather effects and animal behaviours will not leave you indifferent. Moreover you will be required to use the same hunting skills and techniques as in real life. Within the game you will acquire all the necessary tools of the trade to bring in your trophy. Hunt the powerful and dangerous North American Grizzly Bear! Use all your tracking skills to find the Elk herd and take home a priced Elk antler mount! Call in the elusive and gigantic bull Moose, with antlers over 10 feet in length! Take down a world-class Big Horn Sheep for your Trophy Room! Photo realistic hunting scenes and location specific effects place you on location like never before! Selection of weapons: 7mm Rifle, 300 Mag Rifle, 44 Magnum Pistol, and Compound Bow each outfitted with a scope ready for long range big game hunting! Use specific animal calls to mimic real world behaviors and attract the largest animal in the area. Choose from 16 different hunt stands spread out over the rocky mountain west: Colorado, Utah, Montana, Idaho, and Wyoming! Binoculars with variable zoom and range finder to spot wandering big game animals. Use your Camera to document every trip and share those photos with friends over email. Hunting statistics to track progress and establish bragging rights! Trophy room with 16 different big game trophies each in a unique mount position. Brag about your trophies! Send the trophies to your friends over email - proof you are a skilled hunter! If you feel attracted and are eager to find yourself in the lap of nature and become a real hunter then you can download the game right here, just for $2.99.